In the nineties there was a popular movement of people practicing random acts of kindness and now there is even a Random Acts of Kindness Foundation that “is committed to spreading kindness”. The Free Farm Stand has become a place where people come and practice random acts of sharing of food and I think it is very sweet and a big turn-on. Lyz whom I haven’t seen in a while came by with some squash she had grown in her Potrero Hill garden. It was a great example of what I had hoped would happen with the Free Farm Stand. That someone would pick up some seedlings they had gotten from the stand and then bring back some of the extra produce to share with others. I think for that for the idea to really take off I would need someone to hang out by the seedling table to talk to people wanting plants, and to explain the idea behind sharing free seedlings. It would also need to be someone to speak Spanish ideally and who would have a little knowledge of gardening. I want to eventually help people more than I do now to start gardens in their backyards, either by just giving advice or having a crew of volunteers that would help put in gardens for people and be their garden mentors throughout the garden season. Lyz also brought by some vegan Horchata in a thermos that she had made to share with people. A real random but beautiful gesture that I always appreciate. I thought it was delicious and she is going to send me the recipe that I will share with you (basically almond rice milk with sugar and cinnamon). I think like the honey I give away it is a special treat and we all need to limit ourselves in how much sugar we consume…it can get addictive and is calorie increasing! Plus I am not totally comfortable buying almonds after being reminded of our states out of control almond industry and the negative effect it has on our honeybees. Another beautiful touch to the stand was that Jenny showed up with oregano that she had trimmed the other day in the garden. She dried it and packaged it and printed up instructions in Spanish and English for it’s medicinal and culinary uses. Dave came by with more of his delicious cherry tomatoes from Treat Ave. (this might be the last of them). Jamie brought by more Acme bread. I want to send out a prayer for Fred and Carolyn who started picking up the bread to make it easier for Jamie. Fred is in the hospital and won’t be driving for a while. They were not only picking up the bread, but had just started making sandwiches with some of it and giving them to Rita’s Mission Reading Project for the kids that go there. I am still recording here what is at the stand every week, and I am amazed we continue filling up the table: In terms of vegetables, there were lots of tomatoes (some from the Ferry Building Farmer’s market, salad mix, lettuce, various kinds of greens, a few hot peppers, squash, cucumbers from Potrero de Sol Community Garden, some flowers, and a lot of herbs. I also harvested chestnuts that I helped plant in 1982 on 23rd St. There were also a lot of apples that I picked this week and a bucket of lemons. I also got some plums from the Ferry Building Farmer’s market. And I grew more sunflower sprouts that have become very popular. This week I harvested apples from two locations. First I went back to David’s house across from McLaren Park to pick peaches. One tree apparently had already been picked and the other one the big peaches were not ripe yet. Then we went next door and ask his neighbor if we could pick his fruit trees. He had two apple trees and an Asian pear. He was ok with us doing that so I climbed his small fence and picked a lot of apples. I also cleaned up the ground of apples and separated the apples that were compost from the ones for apple sauce. I think I had three milk crates filled with apples (there weren’t a lot of Asian pears that I could find). 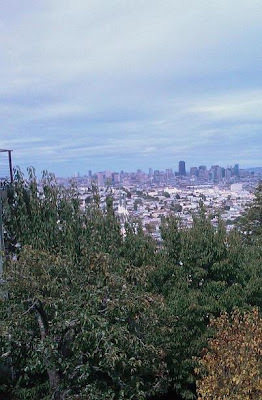 I also went back to the tree on Folsom and harvested another two milk crates of apples and a bucket of lemons. Here is a link to an interesting apple tree story from the Chronicle that someone sent me: http://www.sfgate.com/cgi-bin/article.cgi?f=/c/a/2008/09/19/HOA812OOMB.DTL . Today I started making applesauce with the apples left over from this week; there are quite a lot, mostly ones that I picked off the ground. Turns out they are filled with worm damage and take a lot of work to process. I cut out all the bad parts including the core and seeds. I cut them up a bit and then put them in a pot and cooked them until they were mushy. Then I put them in a cuisinart and blended them until they were pretty saucy. I found that I didn’t like the texture of the skins so I put the sauce through a strainer. I have been thinking of getting a fruit strainer attachment for my kitchenaid mixer that someone gave Angie and I, but am not sure if I want to shell out $100. Maybe I can find one used. I did one crate of apples so far and made about a gallon and a half of apple sauce. It is pretty tasty. I have two more boxes of funky apples to go. Anyone want to have a food processing party? I also have walnuts from our backyard to shell and more honey to put in small jars. If I were really serious about making sauce and giving it away I would need to get a whole canning set up going…getting jars and the equipment. In the old days when I lived in a commune I did all that, but at some point we stopped canning and I think gave away all the equipment. Funny how things circle back around. I’m growing sprouts again too. The chemistry of the Free Farm Stand is actually pretty simple. Throw up a tent and set up a table in the same place and with the same hours every week. By word of mouth let neighbors know what you are doing (trying to make the world better by growing organic food to give away). Then wait to see who shows up to get produce or helps out or observes the interesting scene. There are other details, but basically it is all about consistency and generosity in spirit and in deed. The huge pile of bread showing up in the photos now is an example of that alchemy, and personally I find it pretty exciting. It started out with someone wanting to contribute something to the stand because she liked what was going on. She just started working in a bakery that was over baking and threw out fresh organic bread at the end of the day. Workers were allowed to take it home, so she started bringing bread on Bart for the stand. Then another neighbor offered to pick up the bread for her by car. She in turn gave some to her neighbors and to another woman who gives out food to people in her reading program. Then the Farm Stand wound up with eighty loaves of bread (one of volunteers counted them)! We had some left over that I will bring to the soup kitchen that I work in on Tuesdays. It was nice to get a lot of help this week which allowed me to talk to people and to hand out fresh picked berries for tasting. I got an email from a friend that sort of sums things up about the amount of fruit we had this week, it was a bit unreal: “As of late I am especially impressed by your resourceful fruit harvesting in the area! Here we make special trips to take oj to farms outside the city to see where much of our food comes from, and of course lots of it does, but you have really opened my eyes to the continual food production from nooks and crannies all around us.” Actually my eyes are opening too. Saturday morning I had so many apples that I brought some to the Julian Food Pantry on 15th and Julian. Some of them were the last apples from Candlestick Point that Jo had picked and some were from the apples we picked from my friend who lives in Glen Park (we also picked some pears there). On Saturday morning I picked more apples and lemons from a neighbor on Folsom at 23rd. I also picked about a quarter of a bucket of apples from the tree overhanging Balmy Ave. I decided to use the fruit picker I have on a pole instead of hauling a ladder there. I prefer picking the fruit by hand so they don’t fall and break. After I picked the apples a woman came out her door that is right across from the tree and she didn’t know the tree was there (it might not be so obvious unless you notice an apple on the ground). I gave her one and she agreed with my that they were sweet and delicious. I want to go back there in the winter and get grafting wood from it. This Sunday we had four milk crates filled with apples and at the end of the day we had less than a half left. And those were mostly the apples I picked off the ground that were damaged and funky. A woman who didn’t speak English brought a bag of lemons from her tree. And two neighbors Steve and Kelly came by with beautiful extra produce from his dad’s home garden in Sebastopol…delicious dry farmed tomatoes, several varieties of raspberries, and red Serrano peppers that were out of this world! It looks like Fridays and some Saturday mornings work best for me gleaning fruit. I plan to go this Friday to get more peaches and apples. One thing I have started doing is picking up the rotting fruit under the trees. It is a nice thing to do for folks and with apples helps prevent the spread of the codling moth worm that gets in the apples. I have even started hauling away the rotted fruit in cases where there is no compost pile (I imagine the fruit makes good compost). Two friends from Morro Bay dropped by and brought some homemade applesauce. They “glean” produce all year long by visiting their local dumpsters. A lot of the fruit they get is organic (it is so expensive it tends to get thrown out first because people don’t buy it as much is their theory). They get so much food they give a lot away. John even brings his blender to the gym and makes smoothies for his friends after they work out. I realized from hanging out with them that I should get a fruit strainer so I can easily make sauce with the damaged fruit. They cut off the bad parts, no peeling or coring, and cook the fruit until it is soft and then throw it into their strainer. They have an old Hobart KitchenAid that has a fruit straining attachment that works well (apparently different than the models made now). I was talking to another friend that wants to someday set up a food processing kitchen or a food processing tool library so we can share the equipment that we don’t need all year. I’ve got apples now I need to process if anyone has an unused fruit strainer lying around. 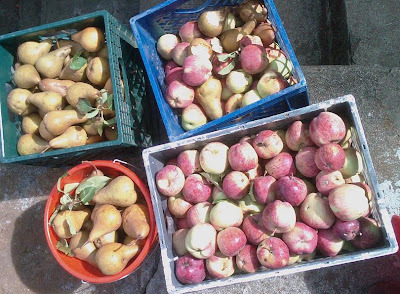 On Friday, David, Brother Max and I picked apples and pears from a backyard above Laidley St. I think in the Glen Park neighborhood. The woman whose house it is said the trees were there before they moved in (20 years ago) and we were thinking they were maybe fifty years old. 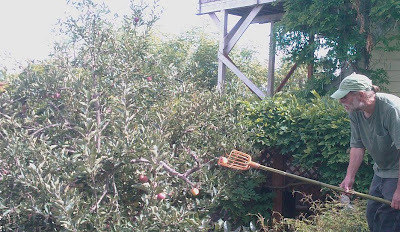 She said the apple tree fell over at one point and it is still producing tons of apples. The views from here place were fantastic. It was fun going to a neighborhood in San Francisco you haven’t been to before (like we did last week to McLaren Park). David has been exploring stairway walks in the city for a while and told us we should check out the Harry stairs while we we there. So after the fruit picking we walked down the Harry stairs to Laidley St. and were amazed at the sense of being in the woods rather than in a city. The houses on Laidley St. are prety awesome too with some quirky architecture. On that fruit picking trip I found two backyards with lemon trees that looked very unpicked. we need to talk to the neighbors to find out what is up. Our selection of vegetables continues to be modest. I am harvesting lettuce, kale, a few zucchini squash, cucumbers (actually one), hot peppers, lots of tomatoes, and some herbs. I have more seedlings started and I am actually behind in planting. I also have been behind in growing sprouts. Wow, being a farmer is a lot of work!